There are lots of opportunities to participate. You can bring donations to the One Day, One Can event during the Benefits and Fitness Fair in the Cohon University Center, and be entered for a chance at great prizes! You can add to the annual Cans Across the Cut event on the last day of the drive. You can even join in the Snack Bag Packing Party to make snack packs for kids! Events and volunteer opportunities begin in October. Stay tuned! One Day, One Can takes place during the HR's annual Benefits & Fitness Fair in the CUC on the 2nd floor. People can bring a can or cash donations to the event and are entered into a raffle for GREAT prizes! 16 boxes of food and $457.07! We topped our cash collection of $278.00 by quite a bit. What a great day! In 2017, 807 snack bags were packed. In 2018, 1,156 snack bags were packed. You can participate by donating items for the snack bags or by spending your lunch hour helping to assemble the bags. Watch for details in October. “Cans Across the Cut” is an annual, day-long event that takes place on the final day of the Food Drive. Teams across campus comprised of students, faculty, and staff, compete to gather the most canned goods, non-perishables, and/or monetary donations which are lined up side-by-side to extend across The Cut starting at the clock. The winning team gets bragging rights and a trophy for the year! 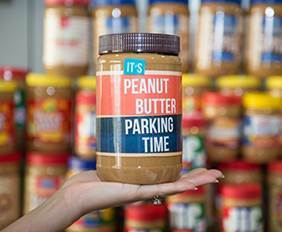 It's Peanut Butter Parking Time! There are three ways you can participate, and help area families in need. All donations benefit the Greater Pittsburgh Community Food Bank.